Looking for a quiet place for a scenic morning walk, but do not wish to deal with the threat of traffic? 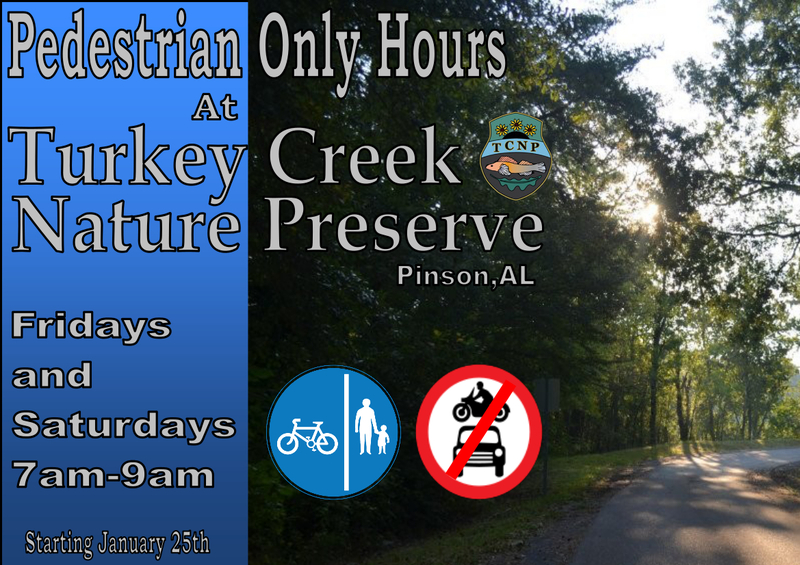 This Friday and Saturday (January 25th and 26th), Turkey Creek Nature Preserve will begin providing pedestrian friendly hours from 7am-9am. During this period, the main gates will remain closed to motor vehicular traffic, but a side gate at the main entrance will be opened to allow pedestrian traffic into the Preserve. At 9am the main gates will be opened, to allow normal traffic flow. Expect these changes to remain in effect for now on. Meaning, that motor vehicles will not be allowed within the Preserve until 9am on Friday and Saturdays.